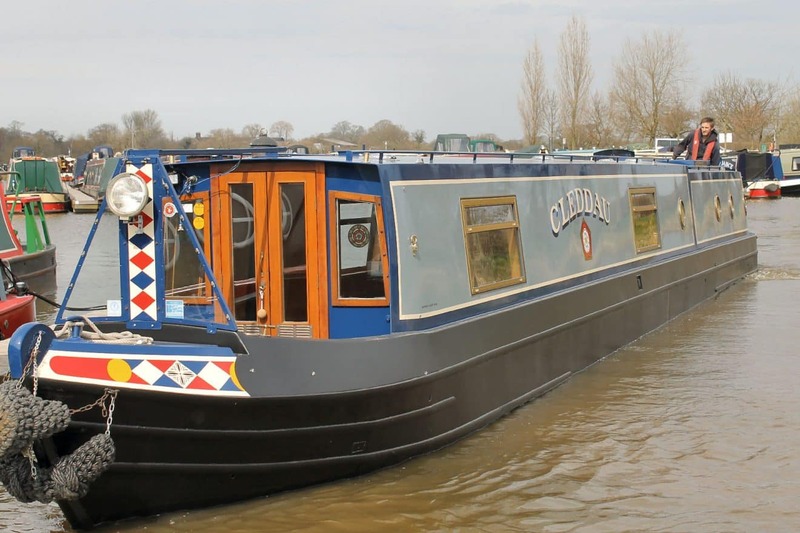 Readers with long memories might recall that last October Cleddau was delivered to Stoke Boats for a midlife makeover. Work was to be done mainly to the rear cabin and engine room, but there were also a few other tasks on the job sheet. There had been a couple of checking out visits in mid-November but then Thanksgiving, Christmas and New Year diverted attention elsewhere. safe from storms and floods, but as the days begin to lengthen the desire to get back afloat steadily grows. A date was made to return to Longport Wharf. Techno Son-in-Law was in tow, eager to see what changes had been made. Across the cobbled yard, round the side of the boatsheds, through a back door, squeeze past a new build boat, get lost in the joinery shop – find a way through to Cleddau’s slot… How can such a large object be so very hidden from view…? “Thought we’d never see you again,” said Mick, the joiner, on Thursday morning. Did he think the crew had absconded to America for good?! Up the step ladder at the bow. A gaping hole on the front deck revealed the water tank readied for painting. questions about which were being emailed to and fro between Stoke and California in early December. On – past the bathroom – no changes there. bedside lockers and overhead shelves. For Boatwif the greatest joy is – an accessible wardrobe! Doors open freely without jamming and the clothes rail is easily reached. A closer look – the radio is fitted and radio speakers are neatly mounted above the bedside lockers. now in place looks taller, broader, shinier than its predecessor, the BMC 1·8. There’s techno-talk ongoing about the dual throttle installation. Then there is the positioning still of the Captain’s Perch on the back deck – and the hull blacking still to go. Back in reception there was an unexpected exchange. A contractor engaged in some hole drilling near the canal edge came into the office. “Is there going to be a high tide?” he earnestly asked. Looks of puzzlement crossed everyone’s faces. Tide – on the canal? Set up by his workmates…? … Perhaps it’s as well Cleddau is still high and dry if a tidal surge is anticipated at Stoke-on-Trent! All looks great. A comment box is a start and before long we will have you linking to all sorts of things.